It’s H-O-T outside and it’s only the middle of summer! 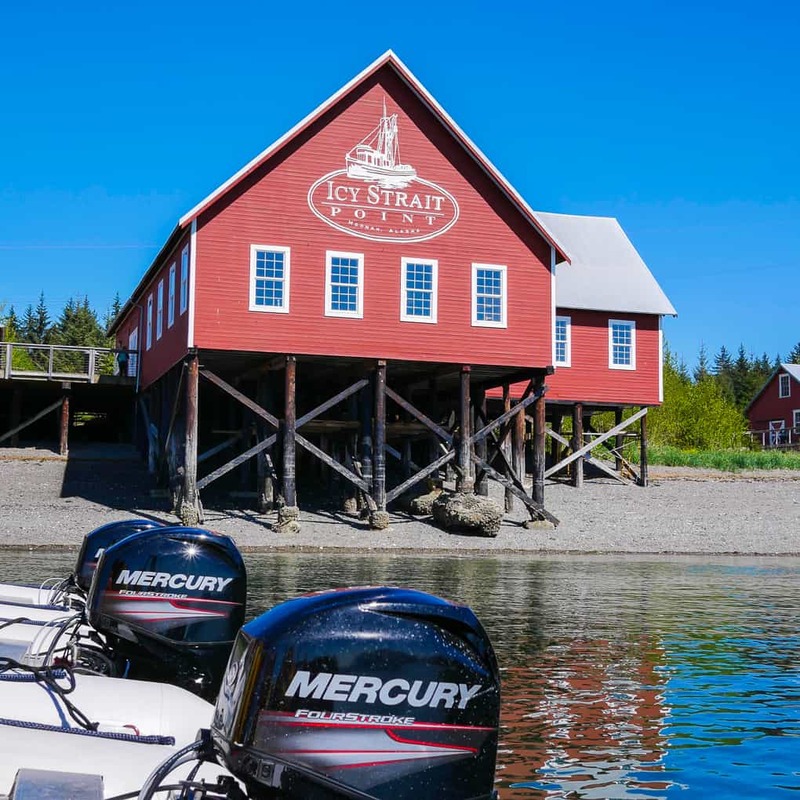 So, pack those bags because there’s still plenty of time to head north to beautiful scenery, cooler temperatures, fresh delicious seafood and plan your Alaska Cruise Excursions. 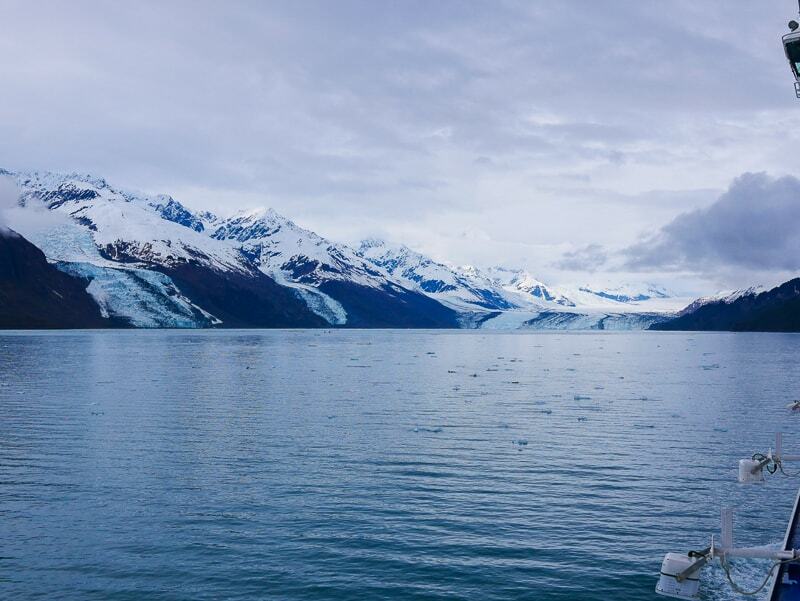 When you cruise with Princess Cruises for their 7-Day Voyage of the Glaciers, you’ll have many options to choose from to experience the true beauty of Alaska! These are just a few of the ones we enjoyed. I know this heat has got you down. 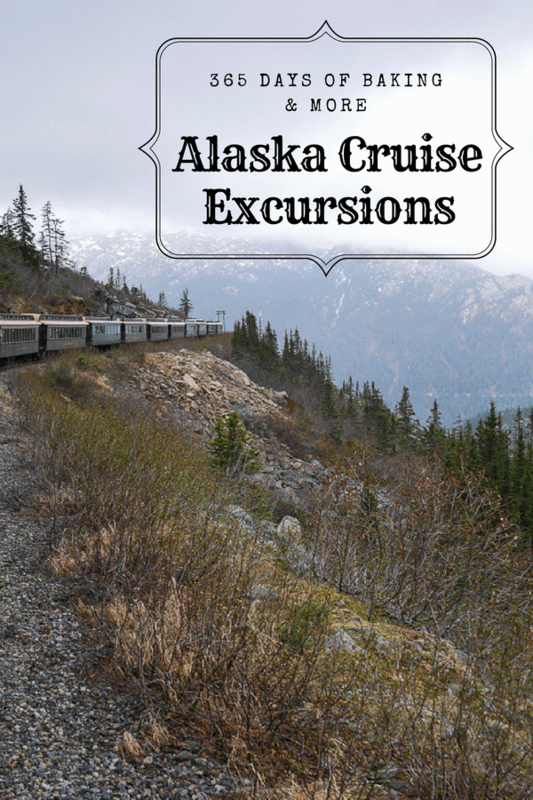 I have been sponsored by Princess Cruises to bring you this post about Alaska cruise excursions, the third in a series sharing our Alaska cruise. As always, all opinions are 100% my own. The whole country’s feeling it. There have been triple temperatures in the east and that right there stinks! What makes it even worse is that gosh darn humidity. I mean, we’ve been experiencing triple temps. here in Phoenix which is definitely to be expected here. But (altogether now) “it’s a drrryyyyyyy heat”. Triple digits are just stinkin’ HOT! SAVE THIS ALASKA CRUISE EXCURSION TO YOUR FAVORITE PINTEREST BOARD! Things start really warming up here in mid-April. When it got to be really warm towards the middle of May, Kurt and I were extremely happy we were headed north for an Alaska cruise with Princess Cruises! This desert girl couldn’t WAIT to see snow and wear a winter jacket! If you’ve never been on a cruise before, I cannot stress enough that you should seriously put it on your bucket list. And I say start with Alaska! I have absolutely fallen in love with cruising and Princess Cruises since my trip to the Panama Canal last year with my daughter, Lexi. The food, entertainment, service, and excursions are top notch! We celebrated her 25th birthday and it was great to spend some mother-daughter quality time together before she moved to Germany last August. This year, I was excited to go somewhere I’ve heard so very much about, but never in my wildest dreams expected to go – ALASKA!! If you have Alaska on your bucket list, Princess Cruises 7-Day Voyage of the Glaciers is definitely the way to do it! You’re able to see so much in just a week and really get a feel for life in Alaska. Kurt, who had never been on a cruise, been skeptical about going on one because of the crowds, dealing with lines, and not wanting to participate in group excursions, absolutely LOVED it!! AND, he actually regretted that we didn’t go on one particular excursion, but more about that a little later. Once you book your cruise and set up your account, you’ll be able to see in your dashboard on the Princess Cruises website where you can book your excursions for each port. There are A LOT and it can become overwhelming. My suggestion would be to read through them the first time and make a list of ones that really stand out and that you’d like to do. If you’ve dreamed of riding a dog sled or flying in a seaplane then write it down! Then go through the excursions with the person who’ll be going with you with a fine tooth comb. By this I mean be sure to read what you will visit and what you will do. Read the Note for every excursion as well. I cannot stress this enough. In the note it will tell you any age, height, health or weight restrictions. It will tell you the length of the excursion and recommend what you should or shouldn’t wear. Times for the excursion will also be listed. All of this information is IMPORTANT! I cannot stress it enough. If you don’t think you’ll be able to walk because you have knee trouble then do not go on a hike. If you have a fish allergy, don’t book the seafood feast. I would hate for you to book an excursion you have your heart set on only to find out once you’re in the group and ready to go that you aren’t able to for some reason. And please, I’m not trying to be rude, it will just save you and the other cruise guests time and energy. I want this to be the experience of a lifetime for you! If you have to make any changes or additions head to the Excursion desk once you board the ship and drop your carry-ons off in your room. I’ve found that it’s the best time to go if I want to change or add an excursion. At this point, guests are boarding and familiarizing themselves with the ship. There will be plenty of time to do that, but you want to book your excursions before they’re sold out. There are seriously SO many excursions and I wanted to do them all, but unfortunately, we could only do one at each port. Oh well, we’ll just have to go again! And I would, too in a New York minute! At Icy Strait Point in Hoonah excursion our Alaska cruise excursion was the Coastal Exploration by Zodiac. Growing up in Rhode Island, the Ocean State, both of our families owned boats and we spent a lot of our childhood on Narragansett Bay. Kurt on a power boat and me sailing. And before we moved to Phoenix we owned a boat that we would often take the kids out on. Now living here and being land-locked, we both jumped at the chance to be out on the water once again in a small craft. I wasn’t sure how chilly it would be. After all, we were going to be on the water in Alaska. But the day turned out to be absolutely glorious, in the low 70’s and WARM by Alaskan standards. The layers that we and others brought we didn’t even need and left them behind. For the excursion, there was a total of 8 people and we were divided up into two smaller groups of four for each boat. We watched a short video on boating safety and how to captain the boat if we wanted to do so. Then we dressed in the rain gear, rubber boots and life jacket that were provided. We didn’t get very wet while we were on the water, but I sure was happy to be dressed as we were because we did get splashed a little. There was also a bit of water around our feet at the bottom of the boat, so my sneakers would have been soaked. Our guide was in a boat by himself directing us where to go and stopping occasionally to tell us about Icy Strait Point, the coastline, the wildlife and life in Alaska. We were able to see some whales and quite a few bald eagles, so that was really exciting! It was an absolutely beautiful day to be out on the water, lasted about 2 and a half hours, and it was one of the best ways for us to start our Alaska Cruise Excursions. Kurt enjoyed being the captain at one point and it was great to see him in his element once again. After our boat ride, we met up with Erin from Dinners, Dishes, and Desserts and her friend, Rachel. We did a little shopping and then enjoyed an incredible lunch of unbelievably fresh Alaskan King Crab legs and shrimp from The Crab Station. Kurt also enjoyed their famous Crabby Bloody Mary! We still had quite a bit of time before we had to board the ship, so the four of us decided to take a walk along the trail. I was just amazed at how stunning it was. The pines were so incredibly tall, it smelled so good and was so peaceful. From Icy Strait Point, the ship sailed to Juneau. While browsing the Juneau excursions, there were quite a few helicopter tours and some even landed on the Mendenhall Glacier! But Kurt doesn’t like heights and I’m not exactly pro-helicopter, so we quickly crossed those off our list. Over the last year, Kurt and I have been doing a date day every Saturday where we enjoy hiking on a different trail. It’s a set time during the week that we look forward to because we’ll be together, go somewhere new and find a new delicious restaurant for lunch after our hike. Since we’d be in Juneau on a Saturday and we saw the Mendenhall Glacier Guide’s Choice Trail Hike we decided to go for it! 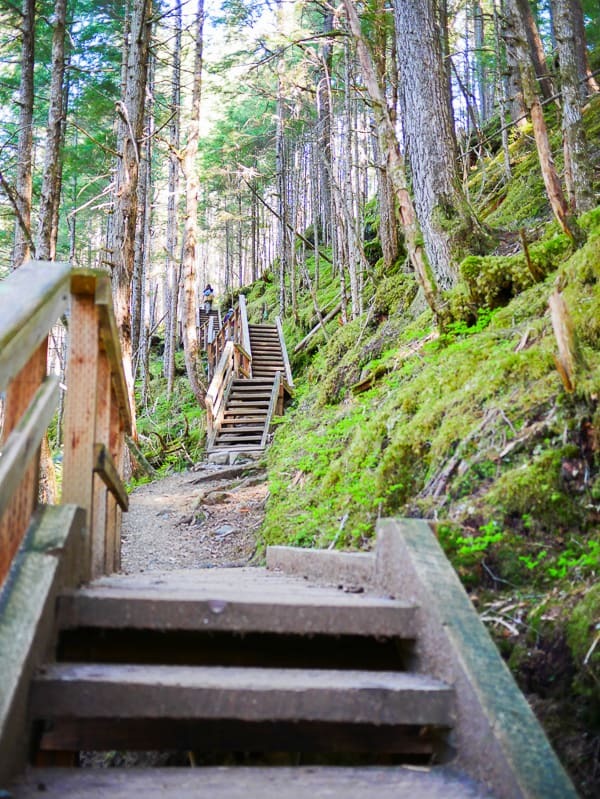 It was about a 5-mile hike with an elevation gain of 400 to 1,000 ft. Sturdy footwear is highly recommended as it can get slippery in some spots and there are some rocks and rough terrain. The scenery was breathtaking and along the trail, we had a couple different views of Mendenhall Glacier, but Kurt and I were disappointed we didn’t get closer to it. We were actually thinking it might be a hike on the glacier, but nowhere in the description does it say that. The blurb says that you’ll be hiking through the wilderness and be able to see it, not set foot on it. Note to self: thoroughly READ the excursion description to make sure it’s what you’re wanting. We did enjoy the exercise. At times it was challenging and there were a couple of older people who became tired as we progressed. If you’re a person who enjoys casual walks around your neighborhood without any elevation change, then this isn’t the excursion for you. There were also some steep stairs along the way. When we were at the bottom of the trail and had a beautiful view of the glacier I did a live Facebook video. It was a lot of fun to share it with my followers and they really enjoyed seeing it. I think you will, too! The next port of call on our trip was Skagway. 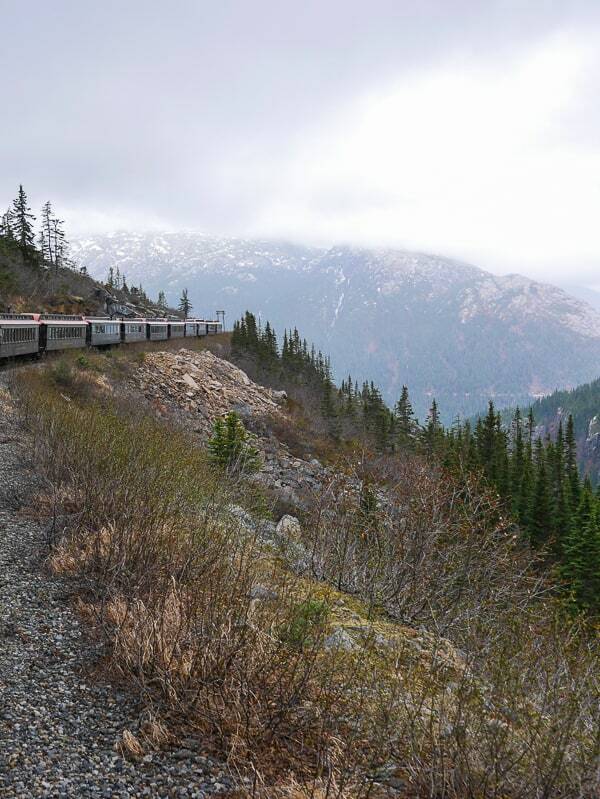 Here, the Alaska cruise excursion we chose was the White Pass Scenic Railway-Luxury Class. 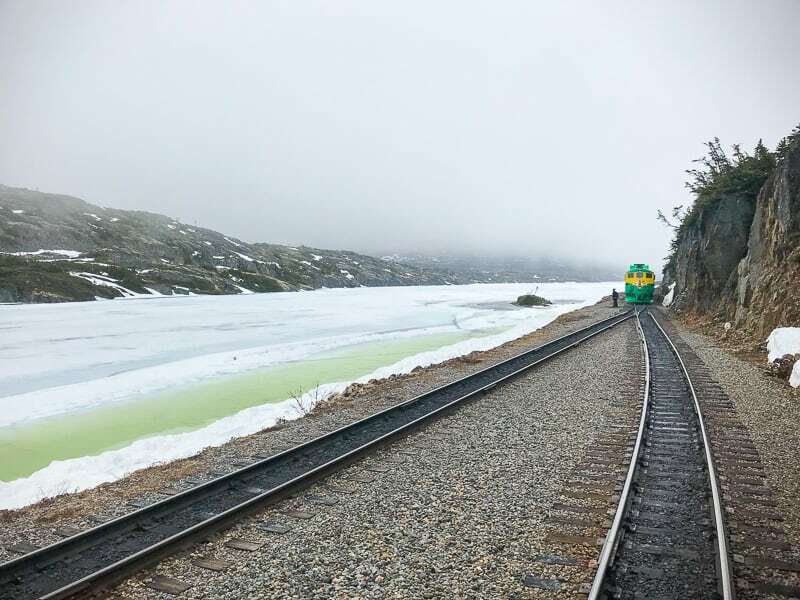 I absolutely love traveling by train and thought this would be a fun and relaxing way to enjoy Alaska. I was crossing my fingers like crazy that we’d see some bears, too! The train is conveniently located just steps away from the ship in port and is very long as it’s a popular excursion. We opted for the Luxury Class tour. This allowed us to sit in the luxury car complete with cushioned swivel chairs, complimentary food, and beverages along with our own private guide. It was pretty spectacular! 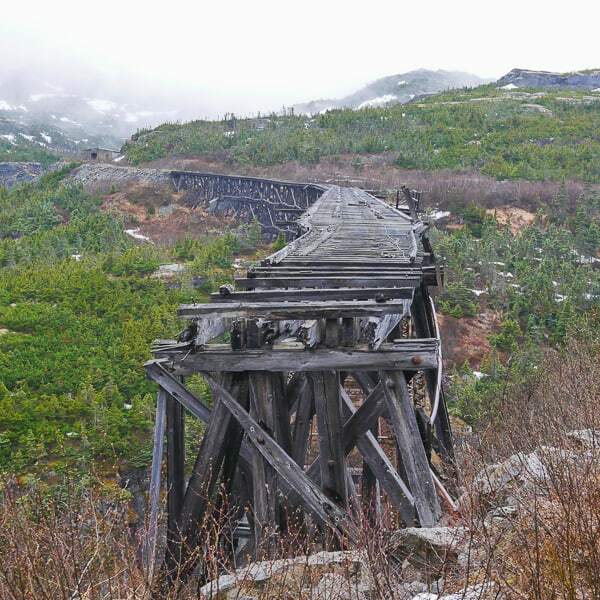 The White Pass Railway originally built in 1898, moves through some of the North’s most rugged terrain. It climbs almost 3,000 ft. and travels just into Canada’s Yukon. The tour lasted about 3.5 hours and was an incredibly relaxing and enjoyable way to see Alaska. It was also raining a bit that day, so we were happy we were in an enclosed excursion rather than hiking. The train took us up into the mountains where of course, we saw snow! It was beautiful and there was quite a bit of it. 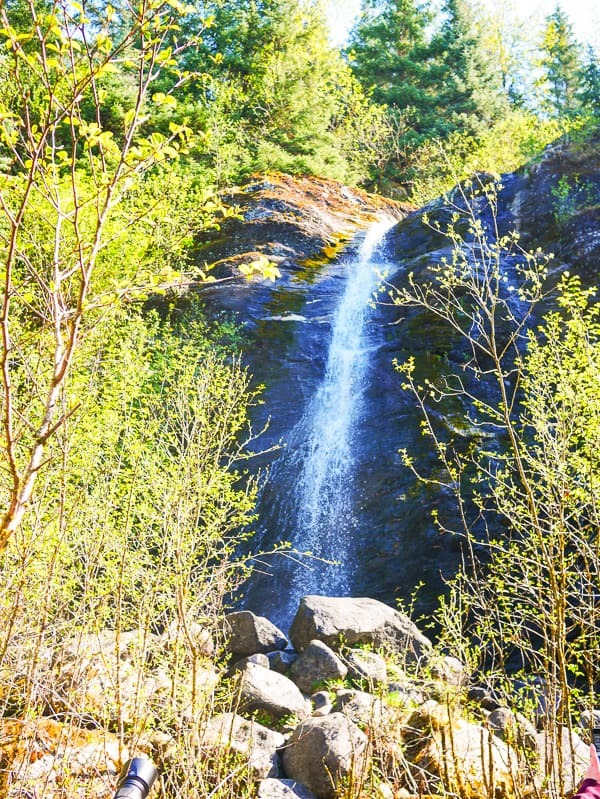 There were many waterfalls, rivers and some old train tracks that were used at the time of the gold rush. Our guide told us so many stories about Skagway, the railroad, and the gold rush, that it left me wondering what time was like back then. Our group of 14 enjoyed a delicious lunch catered by a local restaurant, the Red Onion along with wine and beer. I’ll be sharing one of the appetizers I fell head over heels soon! It was also fun talking to the other passengers about where they were from, excursions they’d enjoyed during the trip and other cruises they were already planning with Princess Cruises. OH, AND I ALMOST FORGOT!! We actually did see a bear on our trip back down the mountain. It was quick and I was so wishing the train had stopped, but I did see it! I seriously can’t recommend this excursion enough as I think you’ll really enjoy it! The next few days we stayed on the ship and viewed the glaciers. I also did two Facebook lives, one in Glacier Bay and another in College Fjord. It was truly gorgeous, chilly, and an incredible life experience. Never in my wildest dreams did I ever think I’d be seeing glaciers in Alaska. I cannot thank Princess Cruises enough for such a wonderful trip! Oh yeah, and that Alaska cruise excursion Kurt wished he’d gone on?? SO… if you’re even thinking about going on a glacier tour with a helicopter ride, just DO IT!! Because seriously, WHEN are you going to have another opportunity to bottle up some glacier water, take a selfie on one and see it from a view that not too many people do? I say, go for it! You’ll be able to see more of my pictures and read more about our trip in this Easy Chocolate Bear Claws post and this Chimichurri Salmon recipe. If you’re interested in learning about other Alaska cruise excursions, here’s a post from another bloggers I was with. Amanda from Amanda’s Cookin’ immensely enjoyed some whale watching along with a seafood feast in Icy Strait Point. She couldn’t stop talking about how delicious and how much food there was! … and I think to myself, what a wonderful word !